Newsted is the band formed by former Metallica Bassist Jason Newsted. Jason Newsted was a member of Metallica for a 15 year period that saw the release of albums including "...and justice for all" and "Metallica" (aka the Black album). Since leaving Metallica in 2001 he has played with Ozzy Osbourne and Voivod as well as his own project Echobrain. This of course means that Jason Newsted avoided being associated with the two worst albums in the history of Metallica - 'St Anger' and 'Lulu'. It's also definitely worth mentioning that prior to joining Metallica he was a member of Flotsam and Jetsam. 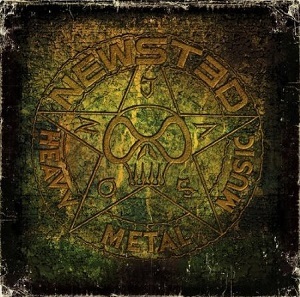 Newsted released their debut EP (Metal) in January of this year, and their debut album (Heavy metal music) is due for release in early August. The first single from the album, 'Soldierhead' was released recently and the album is now imminent. With such a long period as a member of Metallica then the obvious expectation is that there will be a Metallica influence to the sound, and if you're expecting that then you won't be disappointed. In fact with one or two of the songs if you were to replace Jason Newsted's vocals with those of James Hetfield then you could certainly see the songs fitting perfectly into a Metallica album. Having said that though, this is far more than a Metallica style album from an ex member as there are quite a few other influences apparent. If you take 'Nocturnus' for example, the song doesn't sound at all like Metallica but instead has a strong Black Sabbath feel to it in places - the opening in particular. For me, that mix of influences is important - it's inevitable that Newsted will be closely compared to Metallica, so a mix of influences helps give the band a slightly different sound. So, is the album any good? Well I have to say I really like it. If you judge the album alone then it's a great album - not one that's going to redefine metal or anything like that, but it's a good solid metal album. Many people though will inevitably compare it to Metallica, in which case it will compare well against recent albums, but it wouldnt compare so well against their best albums. The album opens with 'Heroic dose' - a nice heavy guitar riff straight away gives you an idea what to expect from the album, and then the drums join in and then the vocals. It's a good start to the album. 'Soldierhead' is the first single from the album. It's another heavy one - but then again the whole album is good and heavy with that Metallica feel - heavy but not played at a blisteringly fast pace. It's another good song, and a good choice as the single. 'Nocturnus' is a track that stands out - it's got a Black Sabbath meets Metallica sound, with the Sabbath sound being the more dominant one. It's a great track and one of my favourites on the album. My opinion is that this album is definitely a good one, and it should appeal to lots of Metallica fans too.